Though Mission and Drama Queens may be receiving much of the attention of diva-lovers with holiday shopping lists, Cecilia Bartoli and Joyce DiDonato are not the only ladies who have recorded recitals this year featuring music from the 17th and 18th centuries. In fact, 2012 has witnessed a near-avalanche of such CDs, many just out in the past several months. This first of two round-ups looks at new discs by Patricia Petibon, Marie-Nicole Lemieux, Christiane Karg, Sandrine Piau and Véronique Gens. I’m afraid I’ve never quite understood the popularity of French soprano Petibon whose surprisingly extensive discography includes at least six solo CDs of which the latest is Nouveau Monde, just out from Deutsche Grammophon. Accompanied by Andrea Marcon and La Cetra—and no doubt inspired by her affection for Spanish music—Petibon’s newest is unfortunately all over the place. In addition to a salutary effort to present music written by Europeans who had traveled to the Americas during the 18th century (drawn from the Peruvian Codex Martínez Compañón), she also includes music by the wonderful José de Nebra and Handel (a section from his only cantata in Spanish). Presumably trying to stay on concept, there are also extensive excerpts from Rameau’s Les Indes Galantes, some of which does take place in the “New World,” but why the bleeding chunks of Charpentier’s Médée? An aria from Purcell’s King Arthur? Greensleeves? It all ends up a bizarre hodge-podge. If the singing had been consistently engaging then I might have been less disturbed by the odd programming, but Petibon’s wacky redhead shtick has rarely been enough to make up for her often wildly uneven singing. To be sure, though, she was on her best behavior and quite appealing at her most recent NYC appearance as Minka in Chabrier’s Le Roi malgré lui with the American Symphony Orchestra in 2005. Nouveau Monde’s simpler selections are often lovely, but the spirited Spanish numbers prompt her to overdo like a second-rate Charo. Her ill-advised stab at the sorceress Médée devolves into a little girl playing “dress-up.” The opening track, an entrancing zarzuela aria by de Nebra, begins promisingly but the da capo repeat disintegrates into an embarrassing collection of scoops and shrieks—who could possibly have decided that this mess was the best way to begin the CD? Her uneven “When I am Laid in Earth” from Purcell’s Dido and Aeneas (how did that get into this collection?) appears in one of the more bizarre music videos made to promote a classical music product. Perhaps Petibon’s more indulgent fans will look kindly on this venture, but it’s likely others will find much of it more satisfying as camp. Québécois contralto Lemieux has had a very active recording career for most of the past decade, but her latest collection of arias by Mozart, Haydn, Gluck and Graun on Naïve isn’t her finest hour (or so). Ably accompanied by Bernard Labadie and Les Violons du Roy, Lemieux has put together an interesting group of arias that mostly bypasses the hackneyed—although Orfeo’s “Che faro” must have been inevitable, but why Cherubino’s “Voi che sapete?” Yet it’s gratifying to discover selections from Haydn’s Il Ritorno di Tobia and L’Isola disabitata, Mozart’s La Betulia Liberata and Graun’s Montezuma; however, her plummy “Deh per questo istante solo” is far from my idea of a Mozart Sesto! Unfortunately, as on her recent Orlando Furioso DVD, a lot of Lemieux’s singing has become increasingly blowsy. Her formerly warm, enveloping contralto now reveals a loosening vibrato which makes some of the items here downright unpleasant. The more meditative arias show her at her best, but when violent emotions are evoked, Lemieux inevitably errs on the side of the excessively melodramatic. Yet I watched a recent telecast of Lemieux singing 17th century music with her frequent partner Philippe Jaroussky (whom she clearly adores and who appears to bring out the best in her) and she sounded grand, so perhaps all is not lost. Having enjoyed her singing in the past, I hope to do so again in the future, but these recent recordings have made that increasingly difficult. 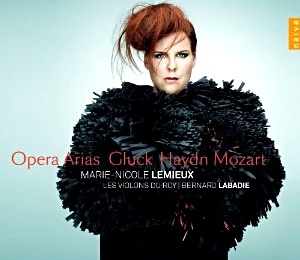 And while Naïve has always been notorious for its oddball covers (all those strange ladies on its Vivaldi Edition), Lemieux’s represents a new low: she really should sue over that hideous portrait! 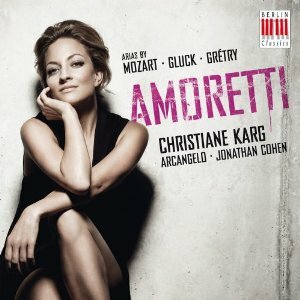 Young German soprano Karg’s new CD Amoretti for Berlin Classics also features arias by Mozart and Gluck, and like Lemieux’s her recital endeavors to avoid the obvious: the CD’s appealing title track Amoretti comes from Mozart’s La Finta Semplice, and the rare Gluck (Telemaco and Il Parnasso confuso) and the delightful Grétry bring credit to Karg and conductor Jonathan Cohen conducting his orchestra Arcangelo. Despite her light lovely voice, Karg’s singing doesn’t yet evince much personality, so the march through these 14 arias can become a long slough. Elaborate coloratura is efficiently dispatched but without the élan to make it truly exciting. Her dutiful traversal of Giunia’s splendidly dramatic Fra I pensieri from Mozart’s Lucia Silla brought to mind last year’s CD by Teodora Gheorghiu devoted to arias written for Anna de Amicis, the first Giunia. Like Karg, Gheorghiu has all the notes but not the dramatic imagination to bring her characters’ music to life. Karg’s Italian and French sound efficiently coached but far from idiomatic (a notable deficit in the sprightly Grétry items), and unfortunately Cohen’s well-intentioned but bloodlessly sedate conducting only encourages Karg’s placidity, particularly in the marvelous “Lungi da te” from Mozart’s Mitridate with its fascinating horn obbligato which here just plods along. All in all, Amoretti strikes me as a premature project. While one would be grateful to encounter Karg as Pamina or Zerlina in a smallish house, repeated listenings of the CD reveal a promising but as yet unfinished artist. However, Karg singing Haydn’s Lord Nelson Mass at this summer’s Mostly Mozart Festival at Lincoln Center revealed a more full-bodied voice, a more confident manner, so perhaps some of the deficiencies exposed on this recording have already been addressed. 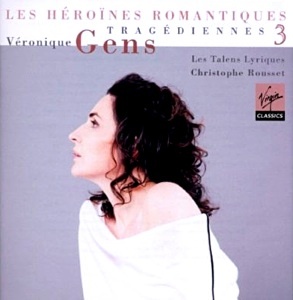 But “Je romps la chaïne qui m’engage” from Grétry’s L’Amant Jaloux—the opening track of Piau’s Le Triomphe de l’Amour—demonstrates precisely what is missing from Karg’s recital. Jérôme Correas’s spirited conducting of Les Paladins immediately springs from your speakers followed by Piau’s suavely confident attack bringing to vivid life this gem from the little-explored genre of early opera-comique. The Grétry is just the beginning of this delightful tour through 17th and 18th French opera, indeed a triumphant return by Piau to the music with which she began her career. During her rise to prominence in the early 90s, Piau was featured in many of the near-definitive recordings by William Christie’s Les Arts Florissants, particularly two Rameau masterpieces, Castor et Pollux and Les Indes galantes-in both of which she sparkled at the Brooklyn Academy of Music in 1993. Yet after these early triumphs, Piau for the most part left behind French baroque–other than a brief return to Les Arts Florissants for its brilliantly irreverent production of Rameau’s wacky Les Paladins. In the meantime, she has evolved into an accomplished recitalist, a leading Mozartean (although Konstanze and Donna Anna were controversial choices) and one of today’s most eloquent Handel advocates, as her two remarkable , prize-winning Naïve CDs illustrate. While Piau’s voice has never been particularly plush and now the top notes no longer ring out as effortlessly as they once did, her sound today remains remarkably fresh and simiiar to what we first heard more than 20 years ago. One never feels any sense of routine— she’s always vitally present, conveying the composer’s music with an endearing lack of ego. Formerly a baritone who co-starred with Piau in those historic Rameau recordings, Correas has continued that collaboration since becoming an accomplished conductor whose group Les Paladins has made a number of very fine CDs. While many of these vocal recitals feature instrumental works (usually overtures) to break up the routine of aria after aria, most of the time those numbers are rarely more than time-fillers. 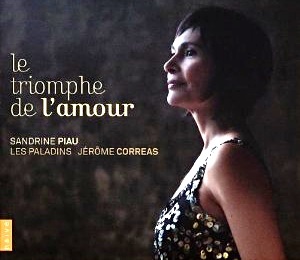 This is definitely not the case with Le Triomphe de l’Amour where Correas’s vibrant music-making (in full command of works spanning more than a century) matches Piau’s as he shares several scintillating pieces which please on their own merits. Alongside Piau, French soprano Gens also rose to prominence with Les Arts Florissants. In fact it seems remarkable that she’s been on the scene now for over a quarter of a century having debuted while still a student in 1987 in the history-making revival and recording of Lully’s Atys. While she continues to sing pre-classical repertoire, more than Piau she has moved on to later music including celebrated recordings of Mozart, Berlioz and Canteloube. Yet a remarkable three-volume survey on Virgin Classics of more than 200 years of French opera—Tragédiennes-may likely prove her most lasting recorded achievement. The third in the series, Les Héroïnes Romantiques, arrived earlier this year. After a first volume which explored Lully to Gluck, the second traced Rameau to Berlioz; and now the third (and final?) volume begins with several late 18th century works (from operas by Gossec, Salieri and Méhul) while ultimately bringing us to Saint-Saëns and Massenet. I wonder if Gens imagined when doing the first disk in 2005 that she’d be recording Elisabeth’s “Toi qui sus le néant” from Verdi’s Don Carlos just a few years later? Her superb collaborator, harpsichordist and conductor Christophe Rousset has always been keen to explore the mostly forgotten corners of the repertoire, and I presume he was responsible for exhuming the arias by little-known composers like Pancrace Royer to Sacchini, Kreutzer to Mermet that supplement the better known works throughout the series which significantly includes Gluck as the touchstone in each of the three volumes. His orchestra, “Les Talens Lyriques,” long one of the best period-instrument groups in the world, consistently shines as it moves from tragédie lyrique to some of the grandest of French grand operas. It’s been fascinating to follow Gens’s maturation as an artist via this trio of CDs. Although she remains a rather cool, patrician artist, there have been new, intriguing flashes of temperament as Rousset has pushed her into the 19th century; however, it must be noted that for a francophone singer, she often does far less with the words than one might wish. And while the top (never her glory) has shortened a bit as the years pass, the rich middle and lower part of the voice have filled out to the degree that she includes several arias usually taken by mezzos or even contraltos: Neris’s aria from Cherubini’s Médée in volume 2 while 3 features Fidès’s “Ah, mon fils” from Meyerbeer’s Le Prophète! One suspects, however, that there will be many listeners who will long for a fiercer dramatic commitment-particularly in the later 19th century arias-than Gens is able to summon. Although several of these CDs are more recommendable than the others—Piau’s is a must with Gens’s most worthwhile, particularly in combination with the previous two, all five provide glimpses of artists who rarely appear in the US in either concert or opera. Unfortunately Piau will not be Jonathas in the upcoming Charpentier at BAM, and I believe that Piau (along with Lemieux and Karg) has never appeared in a staged opera in the United States. And Gens and Petibon have only appeared here in small parts in Les Arts Florissants productions at BAM at the very beginnings of their careers—in 1989 and 1997, respectively. And we’ll get a chance to see what Petibon makes of a role from the standard repertoire when she undertakes Gilda in the Bavarian State Opera’s new production of Verdi’s Rigoletto which will be live streamed from Munich on December 30.